Summertime, soft-shells and other seafood musings! Hi friends! It's Summertime finally (did we have a Spring?!) and that means it's soft-shell crab season. Soft crabs are not their own breed, they're simply blue crabs caught in transition- when the crab has outgrown and shed its exoskeleton, but before its newly formed shell becomes hard again. For the 30 years we've been in business, we've sourced our soft crabs from the same local, family-owned supplier in Easton, MD- Baxter Soft Crabs. The Baxter family is the best source for soft crabs in the mid-Atlantic, it is exclusively their bread & butter! Thanks to our decades long relationship, we get the season's first catch and cream of the crop! We source "jumbo" soft crabs battered with Japanese Panko bread crumbs, served hot & crisp and topped with your choice of one signature sauce: Chili Basil, Bhram peanut curry, Five-Spice, Sweet & Sour. Soft crab season starts when it's warm in May and tapers off in September, so come and get 'em! 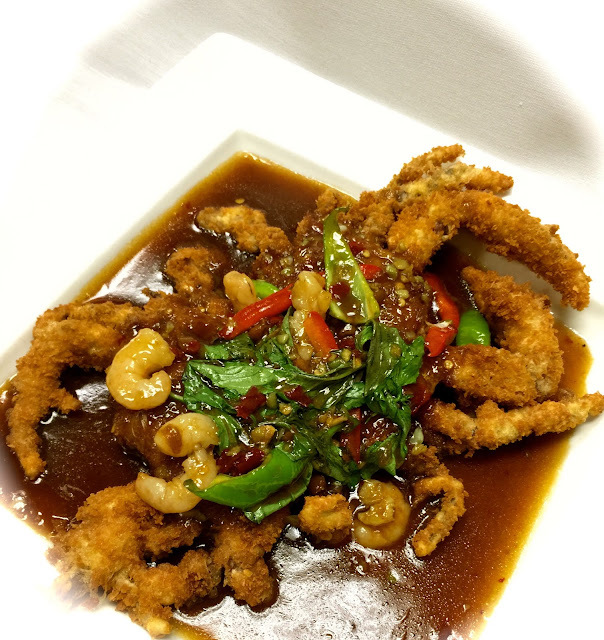 On the topic of seafood, Duangrat's does not bill itself as a seafood restaurant, but we serve plenty of it! Duangrat's procures white domestic wild caught shrimp, seasonal soft crabs, live whole Maine lobsters, sea scallop, and a diverse portfolio of quality fish: wild king salmon, red snapper, rainbow trout, Chilean sea bass, rockfish, flounder, cod. We procure our seafood fresh when possible, at least 3 times a week from only two boutique seafood suppliers based in Maryland's Eastern shore- not a big box restaurant supply wholesaler.